On a Thursday I work from 10:00 to 4:00, and I have a 1.5 hour break from 11:30 to 1:00. 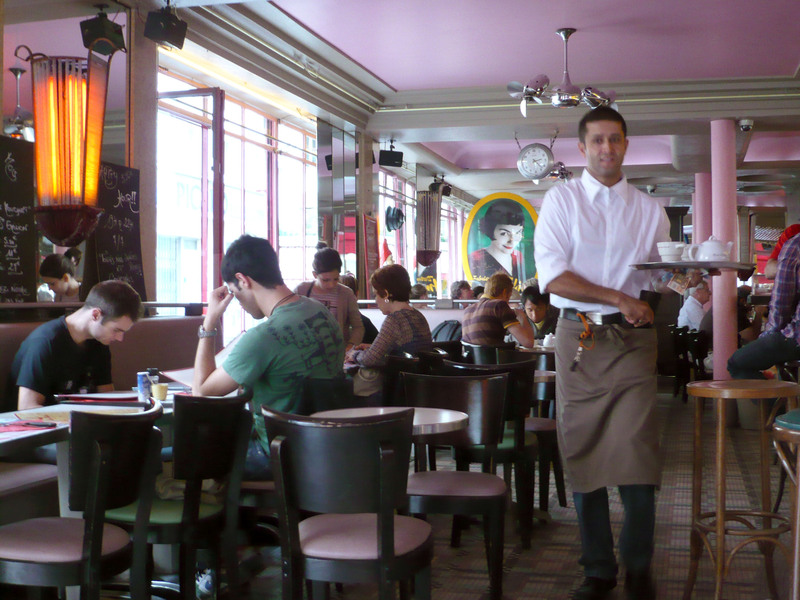 A few weeks ago, I remembered that my friend David (who I met through a Conversation Exchange – we had coffee and hot chocolate at Café des Deux Moulins, the café where Amélie works) actually works in the same building where I have my morning class. Since then, we’ve been having lunch on a Thursday. 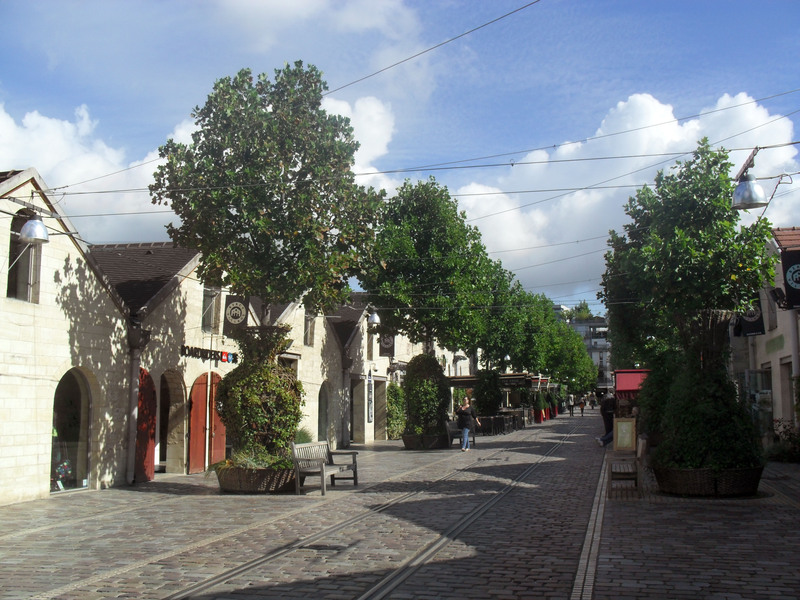 The week before last we went to a French restaurant in Bercy Village called Partie de Campagne. It was lovely and rustic – the walls and floors were all exposed wood, along with the tables and chairs, which were not covered by tablecloths. The walls were decorated with rooster motifs, and general bits and pieces that you would find around a farm, like brass buckets, wrought iron coat hooks and even a wheel (if I remember correctly). The seating was a little bit crowded, but with the warm light and the smell of food wafting in from the kitchen, it felt more cosy than uncomfortable. We both ordered the dish of the day – Canard de Maghreb, for €9.50. The service was very fast, polite and unintrusive, and the food looked beautiful when it was laid in front of us – two slices of duck under a ladleful of gravy, with a small lettuce salad, potatoes and some sort of ham concoction on toothpicks on the side. The duck was okay, but when compared to the richness of the gravy (which we both mopped up with the sliced brown bread from the bread basked), it seemed a little bland. The salad was simple, served with a Dijon mustard vinaigrette, and the potatoes were lovely – a stack of sliced potatoes with cheese and chives, they were a cross between baked potatoes and potato gratin. But what won me over was the ham things – we each had two toothpicks, each one threading through two pieces of ham which rolled around something. I sliced open one of them, and could see some sort of black jam. The combination was incredible – the saltiness of the ham contrasting with the sweetness of the (prune?) jam made my tastebuds sing. As I have a friend visiting me in Paris at the moment, I decided that we could also meet for lunch during my break on Thursday, and we would go to the same restaurant. This time I was left in awe of the service. Bercy is not a tourist area, so I was assuming that I would have to do all of the talking, as my friend speaks no French. As soon as the staff realised this, they assigned waiters to us who spoke some English who were very attentive, explaining dishes, offering suggestions and making jokes. Unfortunately the duck dish with the ham concoction wasn’t on offer, so this time I went with the Formule Gourmand (the suggestion of the day – today a prawn and calamari dish, with a Café Gourmand – coffee with a trilogy of mini-desserts). My friend chose the Boeuf Tartare, and looked a little bit shocked when it arrived French-style – a cylinder of beef mince topped with a raw egg. My dish wasn’t bad – the prawns were amazing, seasoned so well that I didn’t need to use any sauce, crispy with a salt-and-pepper crust. The calamari was a little chewy, and the plain rice was rather bland. Unfortunately the sauce they gave me seemed to be a tomato sauce, thinned out with tomato juice, Tabasco sauce and Worcestershire sauce, which really didn’t compliment the dish or make the rice more enjoyable. My friend was very impressed, though, saying that he couldn’t believe that raw mince topped with a raw egg was one of the nicest things he had ever eaten. It was served with chunky potato wedges seasoned with chicken salt, and salad. Then came dessert – a large plate dusted with icing sugar arrived, carrying a short black and three small deserts in matching white pots – chocolate mousse, crème caramel and slices of banana in a thick chocolate sauce. Not being a coffee drinker, I gave the coffee to my friend and set about attacking the desserts. The chocolate and banana concoction was heavenly, though anything chocolate and gooey is sure to win me over. I ended up eating some of the chocolate sauce with the chocolate mousse. Although the chocolate mousse was good, the other desserts were so rich that I was using it more as a palate cleanser than anything else. And the crème caramel . . . excuse me while I drool. It was ridiculously sweet. The custard was lovely and firm and moist, but I could barely taste that over the generous amount of caramel sauce that had been ladled over it. Every time I dug in my spoon, more caramel would seep into the crevice I had created, and I felt my smile grow bigger and bigger with every bite. All in all, I was very sorry to have to rush to class. Unfortunately we didn’t have enough change to leave a decent tip, so I’ll have to remedy that the next time I go there. Although some moments at Partie de Campagne weren’t outstanding, the atmosphere, service and food highlights are enough to warrant a return visit. And how much was our meal? Two mains, one drink and one dessert for €32.50.